To join Post 63 or Unit 63 simply click on the "Membership Applications" link. Annual Post 63 membership dues are only $30. Annual Unit 63 dues and Sons of the American Legion dues are just $15. There are numerous benefits to becoming a member of Louis K. Juden American Legion Post 63. Our members are friends who have joined together derive great satisfaction and fullfillment from their patriotic support of our youth, veterans, active military, reserve and national guard, and their families. 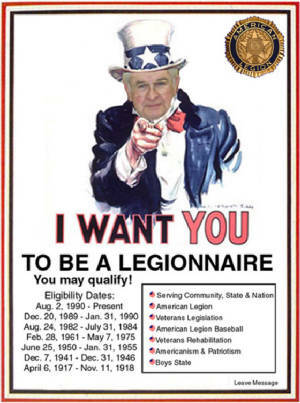 We are seeking eligible and patriotic Americans to join the American Legion. Our focus is on supporting our military, reserves, national guard, our veterans, and serving our local community. We have membership openings in our Post 63, ladies Unit 63 Auxiliary, and the Sons of the American Legion. For applications and eligibiity information, click on the "Membership Applications" link.